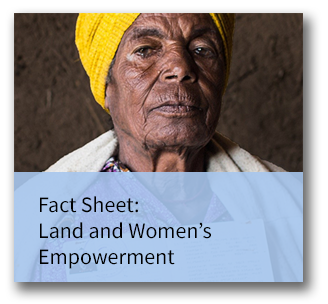 Throughout the developing world women are often the primary users of land and laborers on land but their rights to land and resources are rarely formally recognized. When they have more secure rights to land and resources through inheritance, joint or individual title, through marital property regimes, or through recognition and enforcement of their customary rights, women are better able to participate in household decision making, rent land and earn rental income, access credit and pursue off-farm entrepreneurial opportunities. Importantly, women smallholders who have increased tenure security may be more productive than do women who face tenure insecurity. Increased productivity often leads to higher household incomes. With increased income, women may develop a greater voice in financial decision making within households. This very often means that they are empowered to choose how to use any additional income they generate and women often use this income to invest in their children’s health and education.